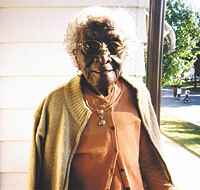 102 years young and still going strong, Claretta “Mother Freedom” Simpson was born Nov. 29, 1901 in Smedes, Mississippi. In her honor, the City of Milwaukee renamed the 2900 block of North 10th street “North Mother Simpson Way,” on August 6. Several elected officials, neighbors and other well-wishers joined the community at a block party on August 14 to celebrate the event. Mother Freedom is truly deserving of her name and this latest honor. She walked in major civil rights marches with Dr. Martin Luther King Jr. She fought for justice beside people like Stokely Carmichael, Lloyd Barbee and Father James Groppi, and continued the struggle for equal rights despite being jailed, hosed, and trampled by horses. Also a local activist, Mother Freedom and her daughter Jeannetta Robinson co-founded Career Youth Development (CYD), a multi-purpose organization that for 34-years has offered services to inner city youth. Neighbors in the 2nd and Hadley Streets neighborhood held a block party to celebrate long-time community activist Mrs. Ethel (Eppie) McGrew, who is 103 years old. Over the years, Mrs. McGrew has received numerous awards and proclamations from city, county, and community agencies. Children and adults alike respect Mrs. McGrew as a compassionate leader in the community. 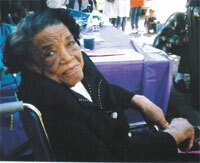 She is a member of St. Mark African Methodist Episcopal Church, where she sang in the choir for 40 years. In the late 1970s and early 1980s, she participated in the University of Wisconsin’s Shoots ‘n’ Roots Urban Garden Program. Through this effort, Mrs. McGrew invited neighborhood children to care for the corner garden plot, teaching them the importance of growing and eating healthy foods. Pointing to the awards displayed on her “wall of achievement,” Mrs. McGrew said, “All of this doesn’t make me any more than what I am.” She is just happy to be alive and able to help others in her community.